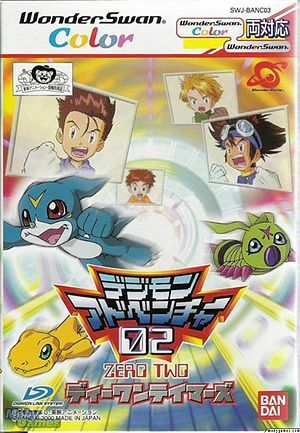 Digimon Adventure 02: D1 Tamers (デジモンアドベンチャー02 ディーワンテイマーズ, Dejimon Adobenchā 02 Dī Wan Teimāzu) is a video game. Shortly after the events in Tag Tamers, Akiyama Ryo hovers over a sickly Ichijouji Ken. Ken notifies him of an online questionnaire of very suspicious origins, which Ryo answers. He is then abducted by one of the Four Holy Beasts (depending on Ryo's answer) in front of Ken and dragged to the Digital World to participate in the D-1 Tournament. It is revealed by Gennai and Piccolomon that the Tournament was staged by the Holy Beasts and that the winner will partner up with the Holy Beast the player chose in the questionnaire. When the tournament starts, the sole Holy Beast explains that the other three Holy Beasts had turned evil and were working independently to claim absolute power for themselves. The strayed Holy Beast called these Tamers together so that the winner would partner with him and either beat sense back into the other Holy Beasts or defeat them. Ryo must complete various quests and win all 5 Ranks of D-1 Tournament that consist of Koushiro, Wallace, Mimi, Yamato, and Taichi as the respective final challenger. When Ryo wins, it is revealed that the tournament was a set-up all this time and that Ryo was meant to win it. Taichi explains that the whole D-1 Tournament was a training program to strengthen Ryo for a battle with an enemy that not even the four Holy Beasts could take on. The Holy Beast emphasize this and says that Ryo is the only one with a strange power that allows him to defeat this evil god, which is nothing more than a survived Millenniumon. After finishing the final training host by one of Holy Beast, Millenniumon's dungeon appears underneath the D-1 Tower, where Ryo have to face Moon Millenniumon for the last time. Millenniumon reveals to Ryo that they both share the same power, which is why only Ryo is able to defeat him. After Millenniumon's defeat, Millenniumon says that it and Ryo were shadow and light, that neither could exist without each other. There is an explosion and Ryo and Millenniumon are blown from the normal flow of time and space. The screen fades out to Ken's room, where Ken talks with Gennai through his computer. As the time passed after the absence of Ryo, Ken believes that Ryo will return one day, as Ryo does seem to have a knack for returning unexpectedly. The gameplay of D-1 Tamers is simply upgraded version of Tag Tamers with easier grinding and Jogress requirements. Ryo is able to obtain Digimon depending on the points of his D-3 and evolve his Digimon depending on its Jogress Point, thus encourages players to Jogress their Digimon as many as possible in the Digitamamon's Jogress Room. Digimon's stats are purely determined by Rank and Evolution Line and a higher Rank will more likely influence the Jogress result than a lower Rank. Ken will also assist Ryo in raising Digimon by analyzing their Evolution Line. Unlike Tag Tamers, V-mon and Wormmon are now able to Jogress during the main storyline. When Jogressing in D1-Tamers, the equipped Digimentals by the parents are able to passed down in addition of the parent's learned Techs. Raising any Digimon's Jogress Points without Jogressing can be done by using JogPlus. Certain Digimon naturally have 2 resistances against certain type of Techs, and can be added by using up to 3 Digimentals. The elemental attacks from Tag Tamers were also revamped and replaced by 5 attack categories: Normal, Bubble, Crash, Mind, and Azad, which depending on Digimon species and the equipped Digimentals. The First Pressing of the game came with an Anime Volcamon card. This page was last modified on 14 January 2017, at 14:25.